I’m a neophyte in Greek wine. Like most baby-boomers, my education started and ended with Retsina. A rustic tavern wine, Retsina is to Greek wine what straw-flask Chianti is to Italian wine: the plonk we drank before we knew any better—and before Greek and Italian winemakers stepped up their game. Named after the pine resin that gives it its peculiar flavor, Retsina dates back to Greek antiquity, when winemakers slathered pine pitch inside clay amphorae to make them impermeable. Now that stainless steel has replaced clay, Retsina is made by placing porous bags with resin into the must to steep during fermentation, much like making tea. 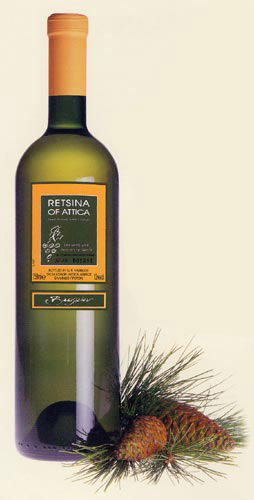 I drank my share of Retsina in Chicago in the early 1980s, along with my friend Cecelia. Our idea of a culinary adventure was to head to Greektown and feast on flaming saganiki doused with lemon, heaping mounds of moussaka, and lamb with rosemary potatoes. We’d wash it all down with a bottle of pungent Retsina. It’s nasty stuff. With its penetrating aroma of pine resin, it was as inviting as floor cleaner. But we’d grimace and pour ourselves glass after glass. Greek wine has come a long way since then. But I’ve only hesitantly dipped my toe into these waters. I’m a bit fearful of the geography (“Now, where’s Thrace? The Peloponnese? Santorini?”) and intimidated by the grape varieties (try pronouncing Agiogitiko or Xinomavro*). Even so, when I visit Cecelia these day, who's now living in Washington DC, we often head to the sleek hotspot ZAYTINYA, where chef José Andrés’ offers delectable, contempo renditions of Greek cuisine. It has a great by-the-glass list, allowing me to get my feet wet with samples of bracingly fresh Assyrtiko (fabulous with grilled octopus) and quaffable, slightly chilled Agiorgitko (a medium-bodied red that plays well with spicy chickpeas or lamb kebobs). Six months on the lees give this wine a soulful richness, while high-altitude vineyards mean mouthwatering acidity—a hallmark of the Assyrtiko grape. Though it originated on Santorini (an island between the mainland and Crete), Assyrtiko also thrives in northern Greece; this producer, Ktima Pavlidis, is located in the northernmost part of Drama, which is the northernmost wine zone within Macedonia in northeast Greece. So it's north, got it? Yes, Retsina can be good! I particularly liked Domaine Vassiliou’s version, where the pine resin was just a background note rather than a full-blown chorus. “We’re trying to elevate the category,” says owner George Vassiliou, bless him. While the pine in Gai’a’s Ritinitis was more upfront, it was intriguing rather than off-putting. Suggesting rosemary and eucalyptus, it could easily pair with herbed chicken or even lamb. But both wineries have a tough battle ahead if they expect to change public thinking about Retsina. It’s still churned out all over Greece, so these quality-minded versions are a drop in the bucket. Making matters worse, “Retsina cannot list a vintage by law,” says Paraskevopoulos, “and that’s the trouble. After 10 months, it tastes like turpentine. But there’s no way of knowing how old the bottle is.” The safest guarantee is to stick to these two producers; they sell out fast. The only sparkler here was this Moschofilero. It’s a real winner, offering a delicious core of ripe apple with scents of hay inside a refreshing spumante fizz. Domaine Spiropoulos is Greece’s first certified organic winery, but its roots go back to 1870. It’s located in the archeologically rich Peloponnese, a large peninsula that’s the southernmost part of mainland Greece. I’m always interested in trying a dry, still Muscat, and I liked this one quite a bit. Though made from the Muscat blanc à petits grains variety—the same as in Moscato d’Asti—this island wine is brimming with pink grapefruit rather than the honeysuckle and orange blossom I associate with Piedmont’s moscato. With 4 grams of sugar, there’s a subtle hint of sweetness, but it’s married to a bright acidity. As its name indicates, these vineyards are high up, and being fanned by cool winds sweeping off Samos’ mountains, they’re key to this perfect balance. Happily, most of these wines retail for the everyday price of $12–17. “We only stock wines we like to drink on a regular basis,” says importer Andrea Englisis. Did you notice I didn’t mention any reds? In fact, I was so smitten with the whites that the tasting closed down before I could start my second and third laps for the reds and dessert wines. Next time. But I did manage to return to the Gai’a table for some quick advice from the affable Paraskevopoulos. “If you went to Greece for a vacation that combined winery visits and archeological sightseeing, where would you go?” I asked. He took my map and pen. “You start with two days in Athens,” he said, scribbling. As a one-time art historian, I nodded in approval. “Then you spend three days in Santorini,” he said, circling the tiny Aegean island. That was puzzling. Though I’d developed an affection for the zippy Assyrtiko grown there, Santorini seemed so tiny. What could be worth three days? “Go for the dining,” he replied with a broad smile. He then circled the Peloponnese. “One week,” he insisted. “For the wine, the archaeology, the culture.” I noticed that Arcadia is there: home to Pan; an unspoiled paradise in countless Renaissance paintings; and source of that enticing sparkler, Ode Panos. I’m onboard with that. Cecelia, are you listening?